Earlier this week, we were visiting family near Sarasota, Florida (escaping the lingering Montreal winter). During our stay, we treated them to a few homemade dinners. For desserts, I didn’t want to do anything too complicated… besides being too nice to stay inside and bake, I didn’t have all my kitchen/baking supplies. So I sourced this delicious no-cook parfait. What makes this parfait particularly interesting is folding melted white chocolate into the whipped cream. It doesn’t look different than plain whipped cream, so you get a pleasant surprise at each bite. 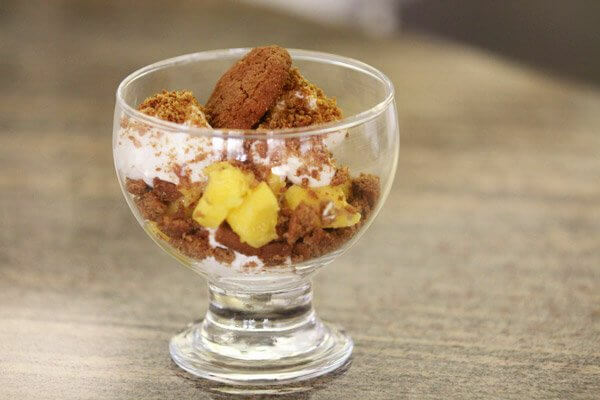 Mango was the perfect to enjoy in the warm Florida sun, and the crumbled gingersnaps provided nice crunch and contrast. I’ll definitely make this again for an easy but very delicious summer dessert. (And I’ll likely experiment with other fruit, such as pineapple or raspberry.